Reading at Wikipedia website I learned that whirligig beetles got their common name from their habit of swimming in rapid circles on the water surface when alarmed. They are known for the bewildering and rapid gyrations in which they swim, and for their gregarious behavior. I named this photo “Whirligig’s dance floor”. 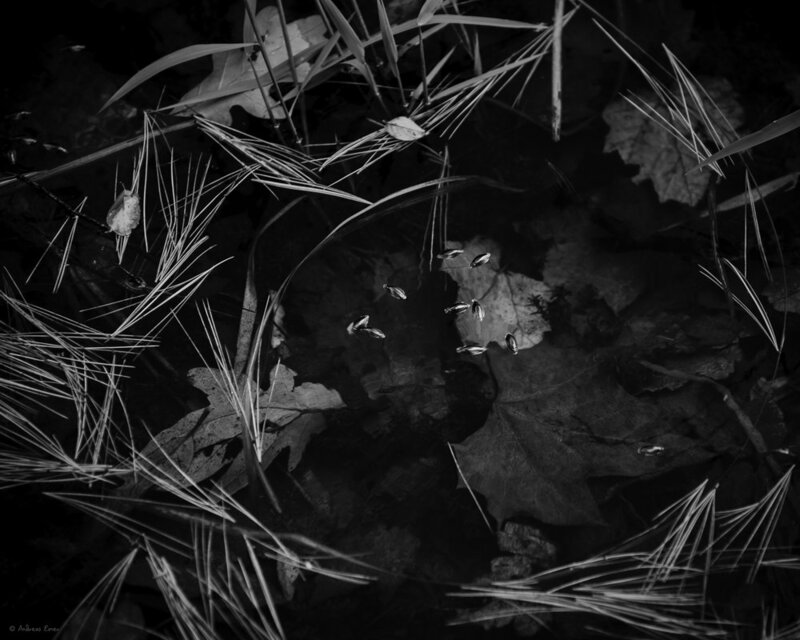 The crazy, dance like movements of the water bugs had shaped the open circle on the water, surrounded by pine needles and grass. In this low light situation I shot the Nikkor 24-120, f/4 wide open at 120 mm and focused on the leaves under water to give the scene some depth. The natural light of the setting sun gave shape to all the elements that make this photo one of my favorites from our trip through West Virginia.